I’m always interested in reading a new book on this subject, and Dave Canterbury never disappoints his readers! So I was happy to have a chance to review a copy of Dave’s latest bushcraft guide. 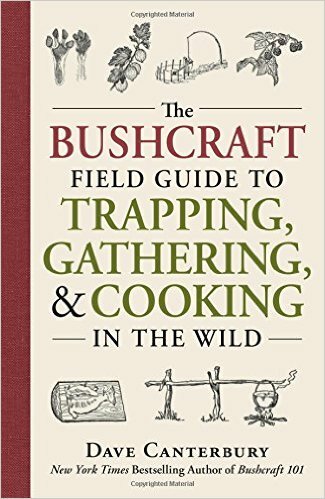 This field guide is divided into four sections: Packed-in Food, Bushcraft Cooking Methods, Living Off the Land, and Emergency Cooking. In this section you’ll learn about what to bring with you when heading out on a camping trip or a wilderness trek. Dave covers what your basic needs will be, depending on how long you’ll be out and how much weight you’ll be able to carry. The tools and supplies necessary for cutting, making fire, sleeping, keeping food, and disinfecting water are covered without going into great detail. (For a more detailed description, check out his book Bushcraft 101.) He also discusses our basic nutritional needs. Basic cooking utensils, pots, pans, dutch ovens, chuck boxes and other supplies and their uses are covered, along with a chart of simple substitutions for food items. The art of building a fire and cooking over it are detailed in this section. A handy chart is included of different species of trees, the BTUs per cord, ease of splitting, and other qualities. So as long as you can identify trees, this information will help choose the best woods for cooking over a campfire. Details on starting a fire with different methods (including using the sun), testing the heat of the coals for cooking, and a section on advanced fire craft are included. An entire chapter is dedicated to cooking equipment that you may wish to pack in. Pros and cons of different types of cookware and how to care for them are discussed, along with one pot cooking, and reflector ovens vs earth ovens. Dave also gives some suggestions for additional cooking equipment that you may wish to bring along. Being able to improvise with the materials available to you in the wild will help to reduce the weight of your pack and Dave shares how to create cutting boards, utensils, and containers with a knife and your own hands. 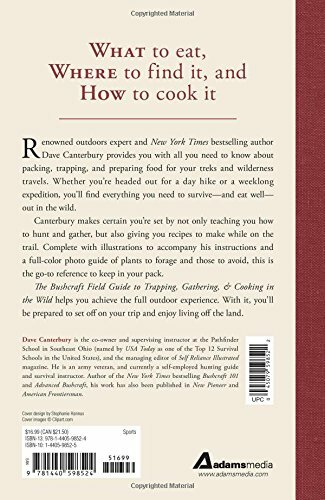 There are details on cooking setups, such as tripods, rock ovens, pot cranes, clay ovens, and his own Canterbury Camp Citchen. There are also descriptions of unconventional or improvised cookware, as well as items you may wish to pack in for convenience. Another last chapter describes the different methods of cooking, such as frying, broiling, etc. This section begins with a short, full color guide to edible wild plants and plants to avoid. (Another, less picky detail…milkweed is listed as a plant to avoid, although parts of the plant are edible. Pokeweed shoots are edible in the very early spring. Just be careful to identify them correctly and only use the edible parts.) There is a chapter on the fundamentals of hunting and trapping, including a handy guide to animal tracks, and chapters that go into much more detail. Choosing your firearms, how to reload spent shells, how to set up a variety of traps for different fish and game, eating animals found dead, and several recipes for preparing your game are all covered. How to butcher your kill and safety concerns are included. I think that some simple drawings might have been helpful in this chapter for those unfamiliar with the process. Dave also covers how to fish and catch frogs, as well as instructions for preparing them. A chapter is dedicated to Dave’s favorite recipes. The Chocolate Cherry Lava Cake sounds super yummy! Some of the recipes are not very close to what I expected in a section entitled Living Off the Land…but they do sound delicious. There is a short chapter dedicated to unconventional foods…in particular, insects! (Does NOT sound yummy to me, but hey, this could come in handy!) There are also chapters on foraging (including a chart of medicinal uses for wild herbs…handy whether you are in the wild or at home) and preserving wild foods (this concentrates on making flours from foraged acorns and cattails, preserving meats, and making maple syrup and candy). In this section Dave discusses the topic of cooking on a hot engine, making sure to put food in foil or a container to prevent contamination from fumes, etc. There are a few recipes included for cooking under the hood that sound very good. 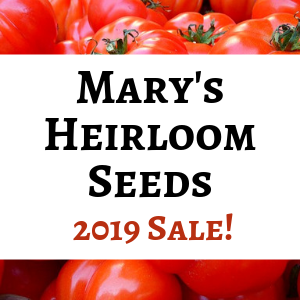 The subject of alternative fuels and making a stove are also covered, including how to build a rocket stove, Swedish fire torch, and small stoves from cans. Solar cooking is also given its own short chapter. This book is small enough to pack with your gear and use in the field and it makes a great read in the comfort of your own home. The recipes are, for the most part, very simple and versatile. All out of opossum? Suggestions are given for substitutes if you don’t have the type of meat listed. Dave also shares the brands of different food products that he has used and liked. I would like to mention that many of the foods he suggests for packing in are rather processed and probably not healthy to be eating on a regular basis. You can make up your own mixes for biscuits, pancakes, etc. to save some money and use healthier ingredients. I highly recommend bringing a trusted field guide to edible wild plants if you intend to forage for food. The short guide in this book will not provide you with many options. There are helpful illustrations throughout the book and each chapter ends with a list of helpful hits and tips. I thought that the arrangement of the book might have been a wee bit redundant, with cookware described in more than one place, for example. But overall, I really enjoyed Dave’s new book and I look forward to trying some out of his ideas, suggestions, and recipes! I received a free copy of this book to review. The opinions are my own and I received no other compensation for sharing this review on my blog.